Evergreen Dental clinic is located on the famous Andrassy out in the very center of Budapest in a fully restored magnificent building from 1870. The certified (ISO9001.2015, GCR) dental office itself is very modern and friendly and will immediately make you feel comfortable. The warm green colors in the waiting room with its nice smell, the available refreshments and high-speed Wi-Fi provide the atmosphere of a living room. The friendly, fluently English speaking staff will make sure your stay will be as pleasant as possible. The generously sized air-conditioned treatment rooms, all between 20-30 square meters are in stark contrast to the usually rather claustrophobic treatment rooms patients come to expect in dental practices. Each of our treatment rooms has a consultation area, where the patient and the dentist can sit down face-to-face and discuss all treatment-related issues and queries. Our clinic specializes in solving all dentistry issues in the most efficient way. Our highly qualified dentists always take the time to understand your problems and expectations in order to find the perfect solution for you. Through our dental models, demo works and digital smile planning software, we aim to give you a perfect overview of the situation and the possible solutions. Our free dental consultation service is designed to explain everything to you and answer all of your questions, allowing you to make an informed decision regarding your dental work to be done. Our services cover all aspects of dentistry, from aesthetic and cosmetic dentistry to complex restorative dentistry like bone graft operations or implant dentistry, even in IV sedation or digitally planned smile and computer-manufactured solutions. Our dental clinic has the best dentistry equipment available ensuring most modern dentistry. The members of our carefully selected dentist team are all English-speaking, empathetic, highly experienced, and have a proven track record of dealing with complex dental issues and will make sure you experience painless dentistry. For further information please read more about our dental team. After you have signed up, one of our customer care advisers will guide you through the process of your dental consultation or treatment and will advise you on all aspects of the dentistry entry requirements and about the whole process until your visit to us. We are a very flexible team and always aim to fulfill special wishes of our patients. We would like to get to know you as much as possible beforehand, so we can perfectly prepare for your requirements and expectations. We look forward to welcoming you to our dental clinic in Budapest, advise you on all dental matters and take care of you in the most professional and efficient way, to ensure your utmost satisfaction. At our dental office, we like to give special attention to all of our patients. For many patients, it is not obvious that to achieve excellent results in dentistry, dentists and the dental laboratory workers need to collaborate in perfect harmony. It is also very important that all the materials used are of the best quality, to ensure maximum patient comfort and a long duration. In order to achieve the perfect fit, we get the patient to try on dentures/bridges etc. several times during production, to ensure that it feels natural, comfortable and performs its function as expected. During fittings, we also check several times that the color is a perfect match and everything is to the patient’s satisfaction. After every fitting, we have the chance to make adjustments based on observations and patient feedback, before sending back the work to the next technological development phase to the dental laboratory. Evergreen Dental works with some of the best dental technicians in Budapest. 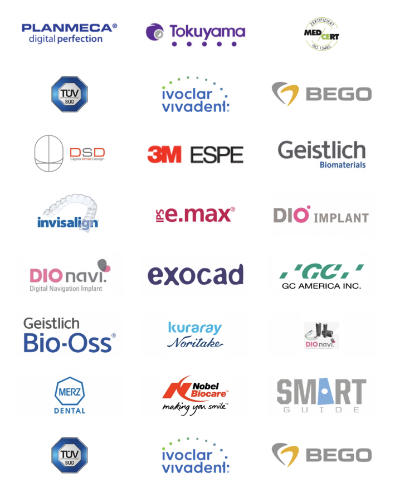 Our laboratory managers and most of the co-workers have a Masters degree in prosthetic works, ceramic lining, metal processing and digital CAD/CAM planning and execution. The dentistry of the future is digital. 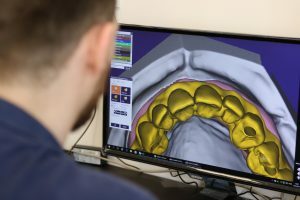 Evergreen Dental already offers these modern, digitally planned solutions such as digital smile planning, computer-aided manufacture and 3D-printing. A big advantage of these solutions is the possibility of saving individual plans on a data carrier, allowing future re-production at the push of a button should a repair or replacement be needed at some point, saving a significant amount of time and effort. In Europe, it is a legal requirement for dentists and dental clinics to give a two-year guarantee on fixed dental solutions. We feel so confident about the quality of our work and the materials we provide, that we can offer 5 years on these solutions and even a lifetime guarantee on our implants. After treatment, you will receive an implant pass and/or a certificate that states the work that’s been carried out and lists all the materials that have been used. Perfectly executed dental work should last for at least 20 years if the patient follows the hygiene guidelines provided by the dentist. We’ll advise you what you need to do to maintain your new teeth the best way possible. Quality materials are of key importance. Ever wondered why some clinics can offer the same work at a substantially lower price? 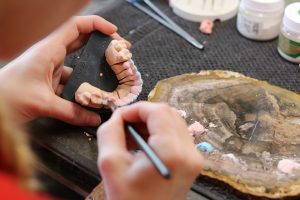 The difference in pricing can mainly lead back to the differences of the specific materials used therefore always make sure you get information about the material used for your dental work. The use of high-quality materials is one of the most important factors in the longevity of your dental work. 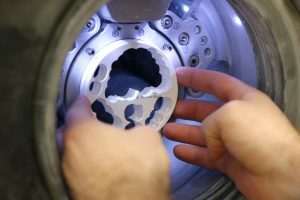 Even using just one average quality component at any point in the creation phase can have a devastating effect on the durability of the dental work and even halve the life expectancy of your dental work. That can mean decades! At Evergreen Dental, both in the clinic and in the dental lab, we only use the best quality materials. 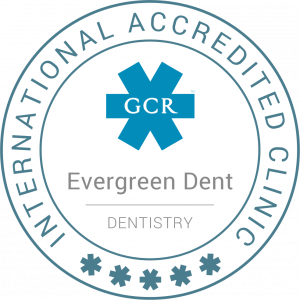 On top of the obligatory implant pass, every patient receives a certificate at Evergreen Dental stating all the materials used and the solution that has been produced. 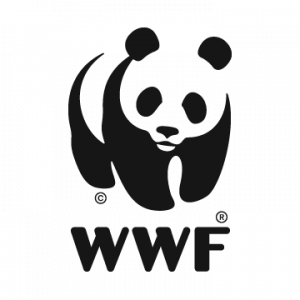 All the materials we use are CE-certified or come from the United States or Japan (as these are the best filling materials for instance). We can’t emphasize enough the necessity of using high-end materials therefore always make sure that you get only offered the best, not the lowest price but the best price-quality ratio should be the aim. Communication – it all starts with understanding each other. Our patient coordinators make sure they define together with you the problem you are facing to be able to prepare you and the dentist team what to expect. Once you arrive at our dental clinic you will experience the utmost patience and friendly approach from all our staff members who will guide you on the way to your new teeth. All our staff members fluently speak English and this will allow you to express yourself in a very detailed way and to be understood. Expertise – all specialists at Evergreen Dental clinic have a proven record of high quality dental work in their field of expertise and long-year experience in dealing with patients from abroad. Further they meet the strict medical protocols of our certified clinic. Those always apply the latest approved techniques and approaches. Personal skills – Taking the decision to have the teeth done abroad is not easy. It is essential for patients travelling abroad to build up trust towards the dental clinic and the dentist team. Personal skills of the specialists are almost as important as their mecial skills. Our patients need to feel secure and understood by our dentists therefore being friendly, empathic and patient are very important characteristics of our dentists. All our specialists will take the time to understand your situation and in order for you to feel well-informed and secure. Language skills – Communication is the essence of success. Dentistry is always a tight cooperation between the patient, the dentist and the dental lab. It is essential that no language barriers hinder this cooperation therefore all our staff members and dentists speak fluently English. We offer best in class dental treatment using only some of the best materials available but at affordable prices. Patient satisfaction is our top priority therefore, we always strive to achieve an outstanding result both in function and aesthetics. For us, the biggest achievement is if our patients are completely satisfied with the work we have done and recommend us to their family and friends. As a result 95% and our patients are happy to recommend Evergreen Dental, almost one-third of our new patients are coming through recommendations. It always a big question how to choose the best dental clinic. Certificates and accreditations always reflect the quality of a dental clinic in an objective way as they use standardized methods to rate or validate a dental clinic. Evergeen dental is an accredited and trusted dental clinic of some of the most important and serious organizations. Over the year Evergreen Dental won several awards that reflect our work. Usually awards are being handed our based on patient satisfaction and reviews. Check out what others say about us to get personal opinions of our former patients. Top 1% of all dental clinics worldwide, in the top ten dental clinics in Budapest. Rating: 4.9 out of 5.0 – 5-star rating based on patient feedback. Rating: 5.0 out of 5.0 – 5-star treatment based on patient feedback. At Evergreen Dental you are taken care of with the biggest professionalism. Contact us with regards to your dentist issues without any obligation and we’ll give you detailed advice. At Evergreen Dental you are in best hands!